Photography by JWD and Jasper Colt @kidcolt on behalf of The Cooking Gene Project. Special thanks to them both for the extraordinary images and video. Special thanks to Chippokes Plantation State Park, Surry County, Virginia; Jennica Walker and the farmers of Surry County. 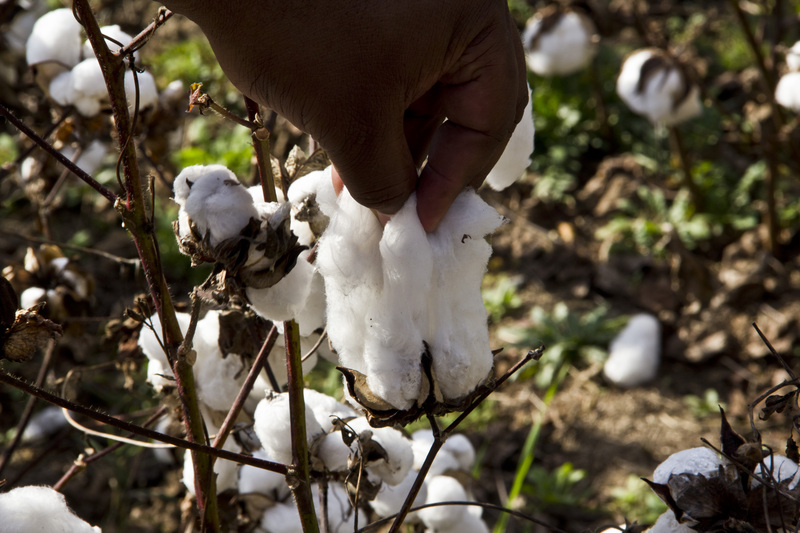 I have grown and picked cotton before. The first time I did, I suppose that I played with the plant. tossed it around in my hands, tugged at it, teased it out of husky boll. I wanted to understand. I wanted to touch the wisdom of the dead. I wanted to tell the last generation born to this life that I could comprehend their sacrifices. The fruit–it is a fruit–is inedible cellulose, it has been called Southern snow. It has no logical purpose in the scheme of nature it seems….maybe birds somewhere use this floss to build their nests. But in early Africa and early India someone made the decision to use it clothe humankind. This plant spread, originally reminding the ancient Greeks of sheep growing on a plant. What a cute but creepy conceit–little screaming sheep spawning on a bush in the East, fauna bursting from flora. It spread, and spread and spread, and empires from Old Mali to those of Mesoamerica knew these bolls. 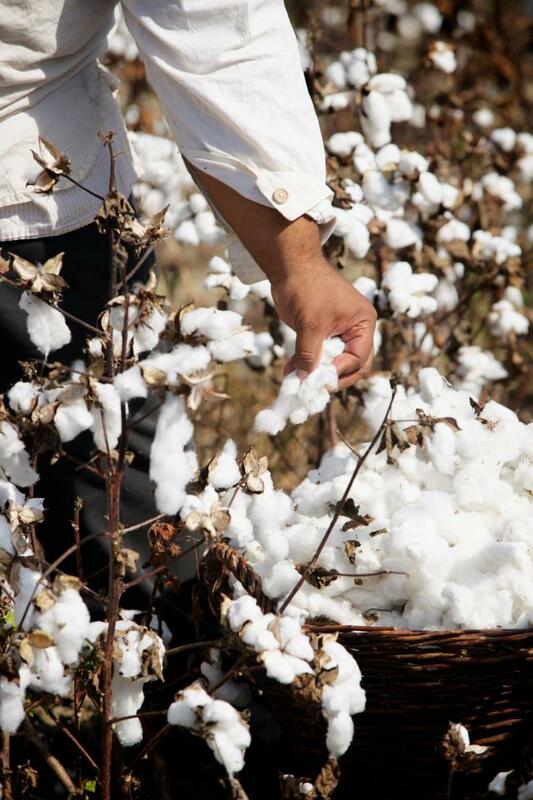 In time, commercially relied upon Egyptian and Indian cottons would face competition from the plantations of the New World where cotton plantations sprang up in South America, the Caribbean and later North America. 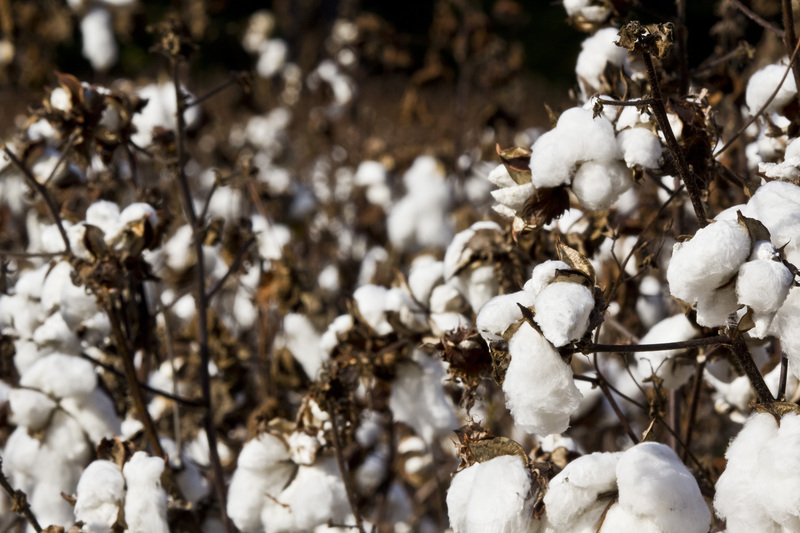 Those first crops were Sea Island cotton, limited to the coasts of South Carolina, Georgia and Florida. 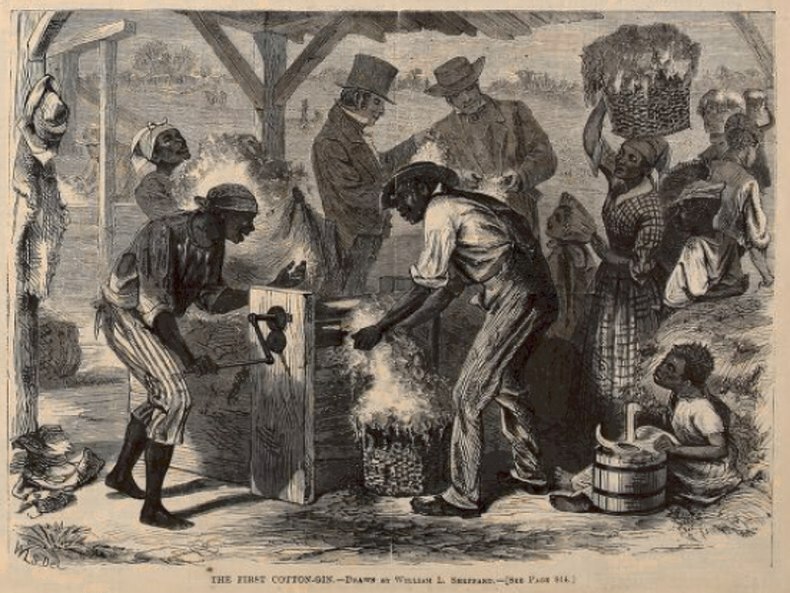 In 1793, Eli Whitney would bring his Yankee ingenuity–read gears and spokes and wheels, cogs and combs—to methods that had been used for centuries among non-Westerners, including the Senegambian ancestors of the very people he saw cultivating that cotton at Mulberry Grove Plantation, Georgia. Though his success would be limited, Whitney’s modern cotton gin saw its first prototypes in the 1790’s and technology would re-write history. My maternal grandmother and grandfather were born in Alabama because a man from Massachusetts came south and made a system profitable that may–may have died on its own. This invention proved the reason for the largest forced migration in American history moving a million enslaved Africans and African Americans from the coastal South to the Southern midlands, Backcountry, and Lower Mississippi Valley and Texas. The explosion in American industry and the Western economy would foment greater migration from Europe to the American Northeast. 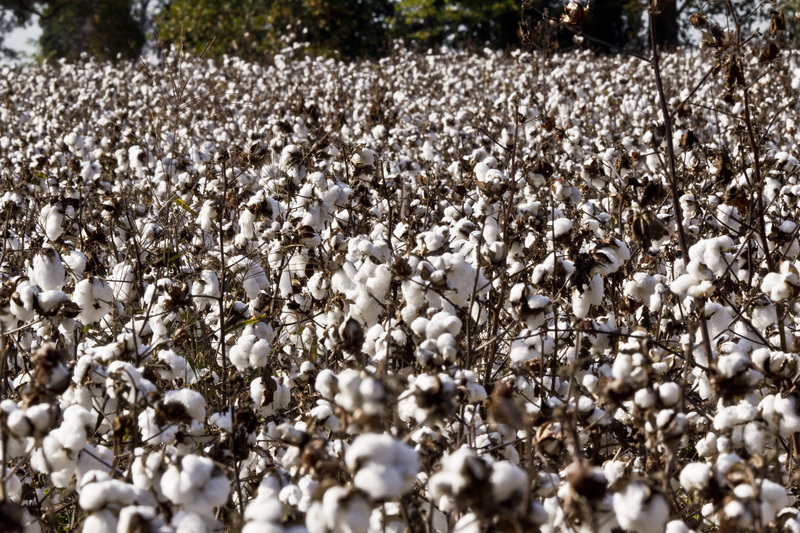 The Cotton Kingdom was not contained. 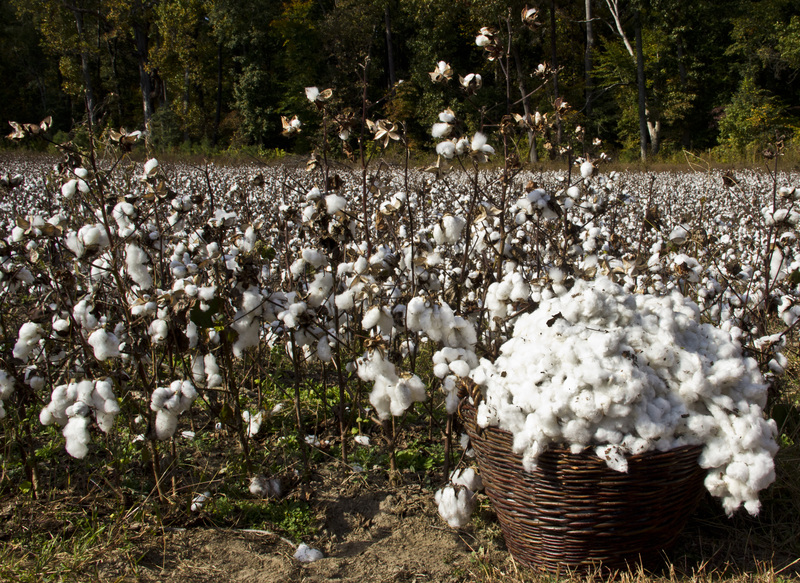 2/3 of America’s export value before the Civil War=enslaved grown cotton processed by new immigrants in the North and the mills and factories of England. Are you blinded yet? Can you imagine the hot sun gleaming off the lint, blinding you? Can you imagine the scratch and tug from the plants at your clothes, the rips and the tears. The slices and slashes in your hands from the burr? This was a small corner of a field maybe 10 acres in size. How endless does this look? How hopelessly endless to get every single lint…Only a whip could force a gang of human beings to get ever single fiber and pick a field clean. The music of these motions could never have been a dirge like spiritual. It had to have been something syncopated and timed and tinny. Something that kept your body down but brought your spirits up. Enslaved people talked often about trying to make it into a competition or a game. That’s survival–play at work and work at play. Dance, music, body, motion, song, prayer in one being. When do I get to scream? So I started to sing and I had to scream. I couldn’t cry, I had to scream. I had to let out a spiritual belch. I sang badly–I can sing okay sometimes, but I sang badly because I was screaming to the Ancestors. I used to read about enslaved people finishing their work with an odd yelp or scream that was bloodcurdling to white onlookers unfamiliar with the culture–now I know why, now I know why. I screamed. Oh Eve! Where is Adam? God called Adam! Adam! Adam! Lord I’m ashamed, oh I’m ashamed! I hear you Lord, I hear you Lord! This is what I have been led to. I would do this for much longer, but Sandy was approaching, and the farmers wanted to get the field culled with the mechanical picker…yet another invention that drove Black history in the United States. I am more proud of my ancestors than I was before. This is how my great-Grandfather went from a sharecropper to a landowner. This is how my Grandfather paid for his way North–with a few bales of cotton. 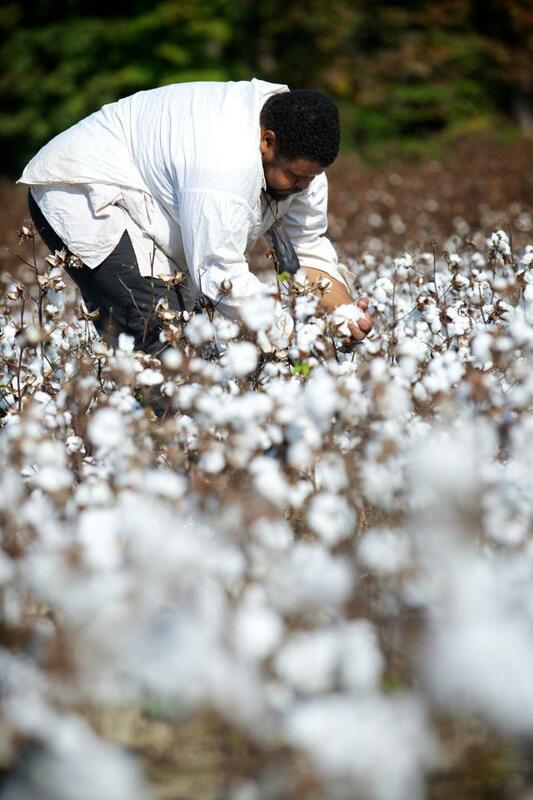 He and his siblings picked some 1500 pounds of cotton. Do I know how strong we are, were, have been and will be? Do I know how strong I should and could be? Can I learn from the past and not just teach about it? My favorite holiday is Pesach. Passover is all about walking into freedom from a narrow place. Mitzrayim. Slavery is a narrow place, a constrictive place, a tight and unyielding jail. 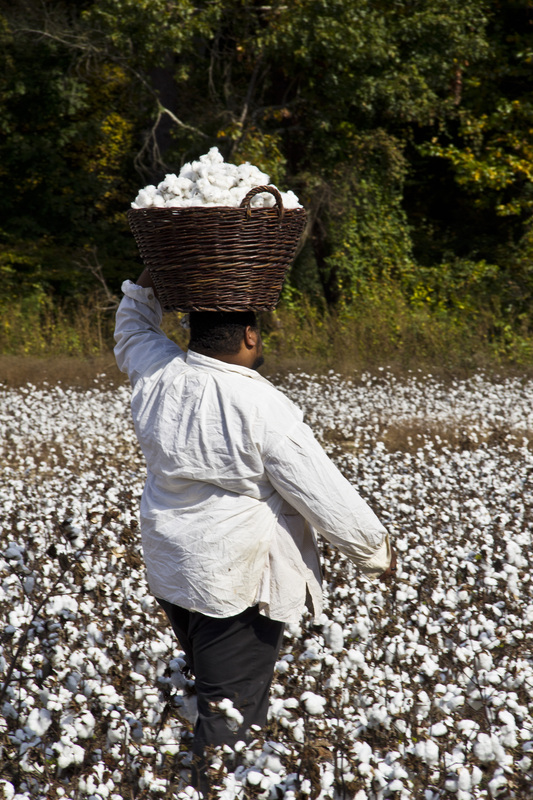 Our ancestors built the storehouses of King Cotton, and left with few of its spoils. The power of these two narratives intertwined is that the cry is as ancient as it is present and contemporary. “Let my people Go,” is no platitude, no cliche. It is the cry of an Almighty G-d who did not create us to live narrowed lives. Who wants to do this? Who wants to break their back? Who wants to make other people wealthy while they have nothing to show for their labors? Who wants to watch abuses of human rights happen while they are worked to death? Who wants to always hope, and always dream of a miracle to magically change everything? This was the lot of my forebears. I now know why they never talked. This was too much. 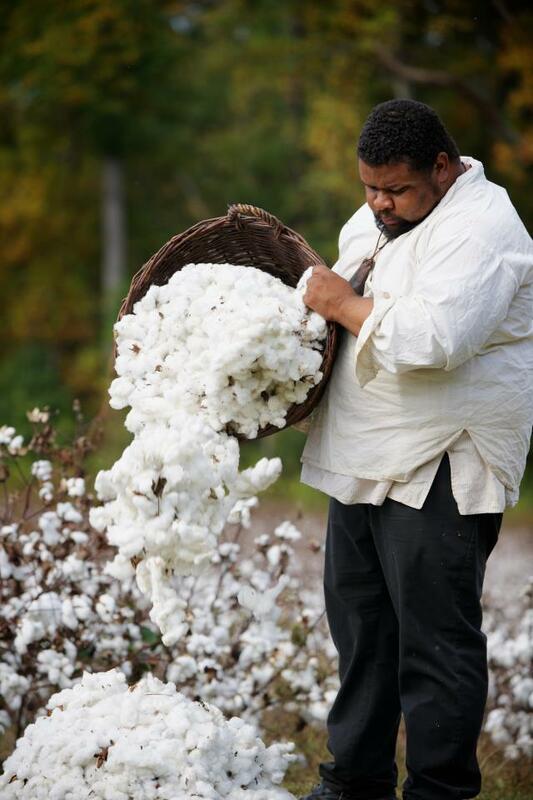 My friend Grant Hayter-Menzies recalled his white grandmother picking cotton as a child and permanently injuring her back, a lesson that left an indelible respect in her for the Black workers who supported her family for generations. A culinary historian has the responsibility to bring out culinary justice into the world. To restore to the people who are your subject the dignity of their human story and their labor. Culinary justice means repatriating to oppressed people the grand story of their culinary work in its full context. 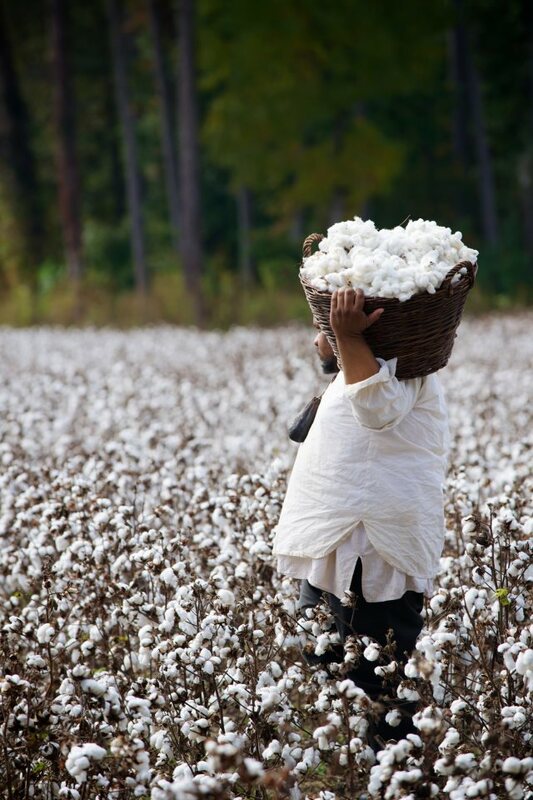 Culinary justice means not just African Americans toiling at cotton, tobacco, rice, corn, hemp, wheat, sugarcane, indigo and in the mines and iron works, turpentine forests and on the waterways and docks. It is every impoverished culture from whom a new culinary and gastronomic prosperity is being built. The un-simple cooking of the complexly oppressed. We need to honor the hands the stirred those pots and honor the work they did and lives they lived when the pots were untended. My husband I saw your presentation at Meadowcroft Village this summer, it inspired us. We still talk about it. This entry is very poignant and the lovely photography illustrates it well. 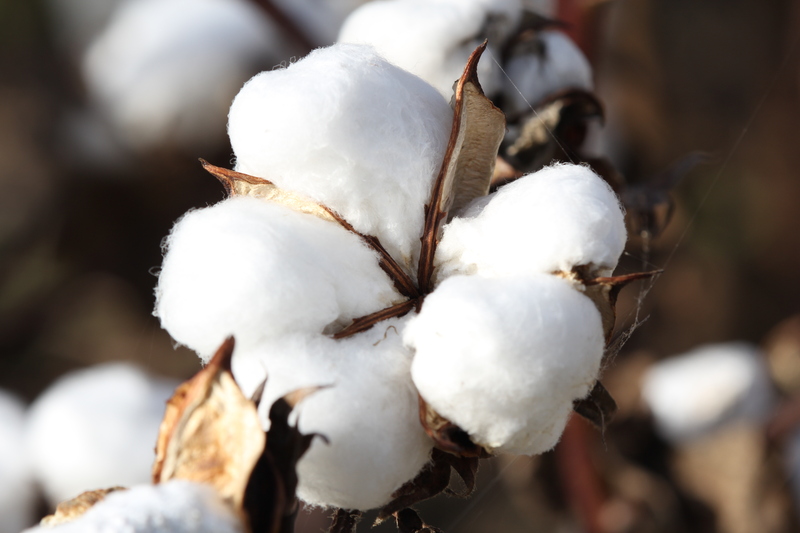 I was fortunate to receive ten seed from green cotton. (Naturally colored cotton are now very rare. 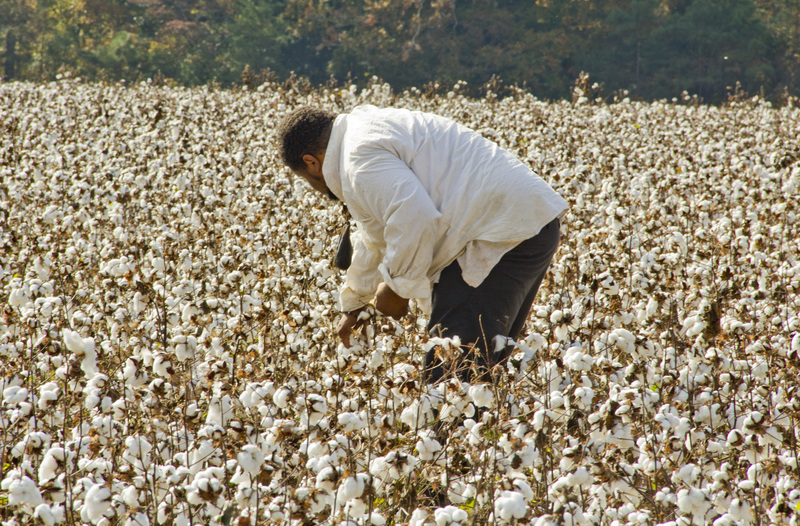 Prior to the Civil War, green, blue, yellow, and pink colored cotton was grown by slaves, as it was explained to me the colored cottons were considered inferior, and also they could know for sure the slave weren’t growing or using cotton from the plantation.) I grew it this year and from it had six plants. I’m in Ohio so I had to start it in a greenhouse and coddle it until the weather got warm. I didn’t get a big crop but I did get enough that I can share some with you if you think you’d like to grow it, or if you’d just like a boll for display. Your blog is beautiful, informative and it is interesting to read what seems to be driving you. This post. Beauty and pain, side by side. Thank you for this education and insight.